The Republic of Rumi Blog: Did Jinnah want secular Pakistan? Followers of Jinnah have always believed that these ideals are consistent with Islam as understood in the conception of Pakistan and endorsed by the consensus of Muslim masses in the sub-continent (See, for instance, p.10 of the discussion paper recently produced by Shahid Hamid for Pakistan Institute for Legislative Development and Transparency with the help of Friedrich Eburt Stiftung). Opponents, at home and abroad, often interpret these words to mean that Jinnah was going secular. 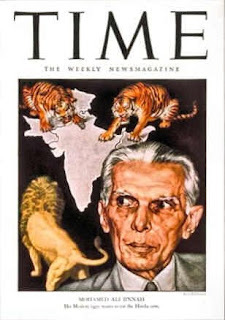 On this basis, religiously-identified opponents argue that Jinnah’s vision was not consistent with Islam and should be modified, while liberals and progressives suggest that since these words betray secular thought, therefore the concept of Pakistan as defined by the founding fathers elsewhere should be thrown out of the window and replaced with Western secularism. What did Jinnah really mean? A few key documents shall be presented in the next few posts (and the popular strand of Rumi, Goethe, etc shall resume after that). Read complete text of Jinnah's speech on the Republic of Rumi Website. I guess he was more towards multi-culturalism then secularism. I don't know why people today are going towards nationalism and forgetting that Pakistan always has diversity in terms of ethnic cultures and each of them needs to repected rather than terming everything under nationalism. It is a very good "Point" which needs to be clarified & you did it well. I've met many people who keeps targeting Quaide Azam on the same issue. I think we are getting "narrow-minded" day by day and it can be possible that such a behavior has been fed into us by our media.. Most of us like to view the things as they want,so they don't bother to think about the real essence..
Ofcourse. Religion of the citizens of Pakistan has " nothing to do with the business of the State…"
Be it Muslim, Hindu , Christain , they are free to practise their religion under the Shariah Law. Jinnah was talkin about the citizens of Pakistan, not its constitution or Courts.